Two homoplasious characters diagnose Vaccinioideae, i.e., the presence of disintegration tissue on the back of the anthers (char. #63; Fig. 24) and a base chromosome number of twelve (char. #89; Fig. 25). However in the combined molecular (Fig. 6) and in the combined morphological and molecular analyses (Fig. 7) Vaccinioideae are strongly supported. This circumscription of Vaccinioideae differs from that proposed by Watson et al. (1967) and Stevens (1971) as it does not include Arbutoideae, Enkianthus, Cassiope, or Harrimanella. A previous analysis using matK and a larger sample of taxa within the traditional “Vaccinioideae” indicates the same pattern of relationships found in this study (Kron et al., 1999a). Vaccinioideae Am., Encycl. Brit. ed 7. 5: 118. 1832 (as Vaccinieae). – Type genus: Vaccinium L.
Shrubs, trees, or lianas, often epiphytic, evergreen or deciduous, with alternate, non-ericoid leaves with margin entire to serrulate or serrate, convolute or less commonly revolute in bud. Leaf epidermal cells lignified or not. Indumentum of elongate and unbranched, or peltate, and glandular to non-glandular hairs, and occasionally papillae. Inflorescence terminal or axillary, racemose, paniculate, or fasciculate, or of solitary flowers; bracts present, bracteoles usually paired, variable in position; flower articulated or continuous with pedicel. Flowers usually 4- or 5-merous, actinomorphic, pendulous. Calyx lobes usually 4 or 5, variable in size, usually persistent, sometimes fleshy; corolla usually sympetalous, urceolate to cylindrical or campanulate, deciduous, with the usually 4 or 5 lobes small to less commonly large; stamens usually 5—10, usually included, the filaments straight to S-shaped, distinct or connate, unicellular-pubescent or glabrous (smooth or roughened), rarely papillose; anthers tetrasporangiate, inverting early in development, ± roughened, with or without a pair of dorsal appendages (spurs), or these occurring instead on the distal portion of the filament, or with 2 or 4 projections (awns) arising from the dorso-apical portion of the anther, with or without disintegration tissue, lacking a fibrous endothecium, dehiscing by terminal pores, and these often associated with tubules. Pollen in tetrads, lacking viscin threads. Ovary usually 4- or 5-locular, or 10-locular due to secondary division of each locule, with axile placentation, superior to inferior; style usually impressed; stigma truncate. Fruit a loculicidal capsule, berry, or drupe; seeds with variable testa cells; embryo with 2 cotyledons. Lyonieae are clearly supported as the sister group to a large clade comprising Vaccinieae, Andromedeae, and Gaultherieae. The Lyonieae are diagnosed by bands of fibers in the phloem (char. #7; Fig. 27), a lignified leaf epidermis (char. #21; Fig. 22), and S-shaped filaments (char. #53, which have been lost in some species of Pieris, and have evolved in parallel in some Styphelioideae and Ericoideae). The phylogenetic relationships within this clade are discussed in detail in Kron & Judd (1997) and Kron et al. (1999b). The monophyly of the Gaultherieae + Andromedeae + Vaccinieae clade is not apparent morphologically, although the clade has a bootstrap value of 98% in the combined analysis (see Fig. 7). Most of the members of this clade, however, possess paracytic stomata (char. #28), although anomocytic stomata are present in Andromeda and Zenobia (Fig. 28). Lyonieae Kron & Judd, Amer. J. Bot. 86: 1298. 1999. – Type genus: Lyonia Nutt. Shrubs, rarely lianas, evergreen or deciduous, with, non-ericoid entire, serrulate, or serrate leaves, convolute or less commonly revolute in bud. Secondary phloem with bands of fibers; leaf epidermal cells ± lignified. Indumentum of stalked glandular and/or elongate and eglandular hairs, or ferrugineous, peltate scales. Inflorescence usually axillary, rarely terminal, racemose, paniculate, or fasciculate; bracts present, bracteoles paired, variable in position; calyx usually articulated with pedicel. Flowers usually 5-merous, but rarely 4- to 8-merous, actinomorphic. Calyx lobes usually small, persistent; corolla sympetalous, usually urceolate to tubular, the lobes small; stamens usually 10, the filaments usually S-shaped, unicellular-pubescent, roughened, or smooth, sometimes with paired spurs on the anther-filament junction or upper portion of filament; anthers slightly to clearly roughened, with a white deposit of disintegration tissue dorsally, dehiscing by terminal pores. Ovary usually 5-locular, with axile placentation, superior; style impressed; stigma ± truncate. Fruit a loculicidal capsule; seeds usually with elongate testa cells; embryo with 2 cotyledons. with a shift from wind to bird dispersal. Generic relationships within Vaccinieae are very problematic (Kron et al., 1999a; Luteyn, 1996) and are currently being investigated by Kron and Luteyn. Thibaudieae Benth. & Hook.f., Gen. Pl. 2: 564. 1876. Vacciniiae Klotzsch, Monatsber. Königl. Preuss. Akad. Wiss. Berlin 1857: 4. 1857 (as Vaccinieae). Shrubs, small trees, or lianas, often epiphytic, evergreen or deciduous, with, non-ericoid entire or serrate leaves, convolute in bud. Leaf epidermal cells not lignified. Indumentum of short- to long-stalked glandular or non-glandular hairs. Inflorescence usually axillary, rarely terminal, paniculate, racemose or fasciculate, or solitary axillary flowers; bracts present, bracteoles usually paired, variable in position; calyx articulated with the pedicel or not. Flowers usually 4- or 5-merous, rarely 3 or 6-7-merous, actinomorphic. Calyx lobes small to large, persistent, the calyx winged or not; corolla almost always sympetalous, usually urceolate or tubular, sometimes winged, the lobes small to large; stamens 5—10(-14), the filaments ± straight, sometimes connate, unicellular pubescent, roughened, or smooth, sometimes spurred (with either one spur or, more commonly, a pair of spurs) on the anther-filament junction; anthers slightly to clearly roughened, usually lacking disintegration tissue, usually with tubules, dehiscing by pores or slit-like pores at the end of the tubules. Ovary (3-)4—5(-7)-locular, or 10-locular due to secondary division of each locule, with axile placentation, inferior; style impressed; stigma ± truncate. Fruit fleshy, a berry or 10-pitted drupe; seeds with short to elongate testa cells; embryo with 2 cotyledons. here placed in Lyonieae, Gaultherieae, and Oxydendreae (Stevens, 1971). with axile placentation, superior; style impressed; stigma ± truncate. testa cells; embryo with 2 cotyledons. Although the Gaultherieae clade is present in all of the equally parsimonious trees discovered in the combined analysis (Fig. 7), its monophyly is not (as yet) well supported. It is probably most closely related to the Andromedeae, and it is likely significant that 4-appendaged anthers (char. #61; Fig. 31) and a base chromosome number of eleven (char. #89) characterize Gaultherieae and also occur in Zenobia. A strongly supported subclade (comprising Diplycosia, Tepuia, Gaultheria, and Pernettya) is diagnosed by the presence of methyl salicylate (char. #88). 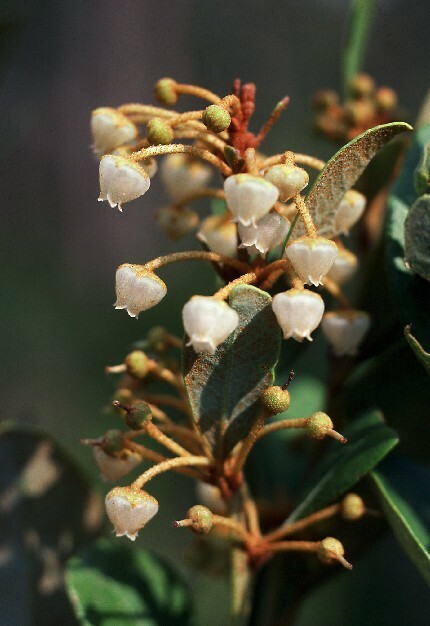 This fragrant compound, which gives the plants a distinct wintergreen odor, has been lost in several species, especially within Gaultheria. Generic relationships are problematic within this subclade, and phylogenetic relationships within this group are currently being investigated (Powell & Kron, 2001). Gaultherieae Nied., Bot. Jahrb. Syst. 11: 145. 1889. - Type genus: Gaultheria L.
Shrubs, rarely lianas, evergreen or deciduous, with entire , serrulate, or serrate, non-ericoid leaves, convolute in bud. Leaf epidermal cells not lignified. Indumentum of multicellular, multiseriate glandular and non-glandular hairs. Inflorescence usually axillary,rarely terminal, racemose, paniculate, or fasciculate, occasionally reduced to a solitary flower; bracts present, bracteoles usually paired, variable in position; calyx articulated with pedicel. Flowers usually 5-merous, actinomorphic. Calyx lobes small to enlarged, often fleshy and colorful in fruit, persistent; corolla sympetalous, usually urceolate to tubular, the lobes small; stamens usually 10, the filaments ± straight, unicellular-pubescent, roughened, or smooth, lacking projections, or with 4 minute to conspicuous awns arising from the dorso-apical portion of the anther; anthers slightly to definitely roughened, occasionally with tubules, with or without a white deposit of disintegration tissue dorsally, dehiscing by terminal pores. Ovary usually 5-locular, with axile placentation, superior, rarely half-inferior; style impressed; stigma ± truncate. Fruit a loculicidal capsule or indehiscent berry, often associated with fleshy calyx; seeds usually with ± isodiametric testa cells; embryo with 2 cotyledons.